When the idea of a one-directional RPG was originally pitched, I thought the game might turn out to be rather one-dimensional. As a title that offers a simple premise, Mystery Chronicle: One Way Heroics offers a surprising amount of depth. There is a brilliant fusion of the procedural rogue-like nature of the Mystery Dungeon series and a world that’s being destroyed with every step. Combining the likes of Half-Minute Hero with a rogue-like is no easy feat and works surprisingly well in Mystery Chronicle’s favor. Although the world is constantly falling prey to an encroaching evil known as the Shine Raid, players aren’t limited to simply moving laterally. There’s a solid thirty paces to the north and south that flesh out the world to explore through. Various biomes and regions, such as forests and deserts, each have their own environmental hazards and territorial enemies that are randomly distributed in each run. Occasional towns and dungeons litter the landscape and can give the player a much needed boost, whether it’s for better gear or to make an interim save in case one meets an untimely demise to a random boss encounter. While each adventure might be starting the hero off from level 1, that doesn’t mean they don’t have to go in unprepared. A type of currency known as Genesis Stones are rewarded after each run (even if the player dies early on) and can be invested in unlocking new classes, perks, and expanding the castle that houses the start of every grand journey with NPC’s and merchants. For those looking to give future generations a head start, a special Dream Vault can house a very finite number of items to take forward. There was a certain longsword that I had grown quite fond of, stacking nearly ten enchantments onto it that I’d take along every time for safety. With durability being such a finite resource, I’d continually hunt down a blacksmith in each adventure just to keep that sword from breaking. Like so many other roguelike titles, items are rarely permanent. As weapons and armor are used, their durability rating continuously decreases. Some character classes and perks can reduce that inevitable breaking, but there’s no worse feeling than having your only weapon shatter just as a boss monster shows up to ruin your day. Items and NPCs that can help repair a piece of gear are incredibly few and far between but there’s a great joy to finally tracking someone down that can put that trusty old sword back into working condition. Ever since I received my copy of One Way Heroics, it has been the number one game played on my Vita. Its shorter runs are perfect for fifteen minute stretches where I just want to go on an adventure and head east. Much moreso than Shiren the Wanderer or any other roguelike on the handheld (save for perhaps The Binding of Isaac), Mystery Chronicle was a title that I just kept coming back to whenever I had a moment to spare. Each and every run felt like I was making an improvement and working towards achieving the True Ending. 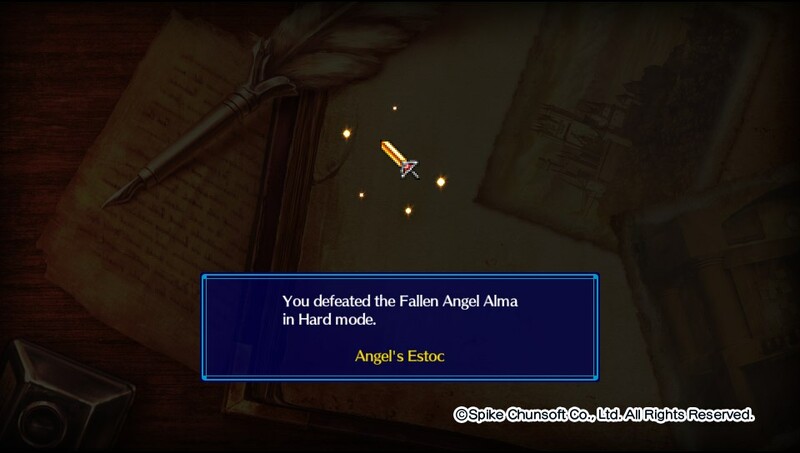 By the time I felt like attempting the 10,000KM clear ending, I had unlocked just about every class and seen Alma’s demise with nearly all of them. Some of the classes felt perfect for my playstyle, the Wanderer and Samurai especially, while others that relied more on Force abilities and spells weren’t just as durable as my playstyle preferred. Having such a diverse range of characters to adventure with gives the player incredible freedom to experiment with that I initially wasn’t expecting out of a title whose primary gameplay element is to constantly run towards the right. From a graphical standpoint, Mystery Chronicle: One Way Heroics isn’t much of a looker. The pixel art gives the adventure a nostalgic design that would’ve been right at home in the 16-bit era. On the Vita, the style works great on a portable screen that doesn’t quite do the same justice for those playing on the Playstation 4. While the title features both Cross-Buy and Cross-Save functionality for those that pick up the digital title off the Playstation Network, I found myself constantly going back to the Vita version whenever I needed my adventure fix. Even if the random nature of the Mystery Dungeon series might not appeal to every gamer, One Way Heroics struck that perfect balance that I had been seeking in an RPG. With just the right amount of challenge early on and the ability to snowball into a run where every enemy can be taken out with a single swing, One Way Heroics gives the roguelike genre a much needed jumpstart into the mainstream. Even as I constantly make progress towards the True Ending and eliminating the menace known as the Shine Raid, I can proudly claim that Mystery Chronicle: One Way Heroics is one of my favorite titles on the Playstation Vita and well worth mentioning as a candidate for my own Game of the Year lists in 2016. PS Vita version tested (game also available on PlayStation 4 and PC via Steam). Review code provided by the publisher. Mystery Chronicle: One Way Heroics is a unique take on the roguelike genre that never looks back. It's a must-have on PlayStation Vita, though of course there's a lot more competition on PlayStation 4 and PC.